186 Results for Vancouver (B.C.) --Celebrations, anniversaries, etc. 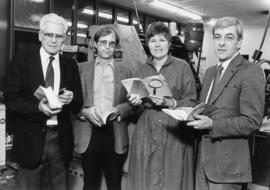 Item is a photograph showing (L-R) Ron D'Alroy, John Setts, Jean Barman and John Montgomery holding newly printed copies of "Exploring Vancouver's Past". 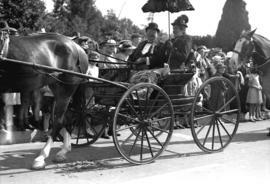 File consists of nine strips of negatives with thirty-two images, eight of which are included as prints, showing Centennial staff and Mayor Michael Harcourt. File consists of two contact sheets with a total of seventy images of a press conference featuring "Chevron presents a Vancouver celebration" and Tillicum posing with "Vancouver Song" composer Megan Metcalfe. File consists of two contact sheets with a total of seventy-two images of Vancouver's 99th birthday party. Item is a contact sheet with 25 images (frames 1A to 25A). File consists of three contact sheets with a total of 108 images and prints of two of these images. Individuals identified are Mayor Michael Harcourt and Vancouver Centennial Commission Chairman Michael Francis. File consists of 68 slides created by the Vancouver Centennial Commission for a presentation. Slides show historical photographs with text provided by the Commission. Item is a contact sheet with thirty-six images. The event took place in March 1985 at Agency Press. File consists of five negative strips with a total of twenty-six images. File consists of two contact sheets with a total of 49 images, two of which are present in the file as prints. File consists of one contact sheet with fifteen images and a print of one of the images. 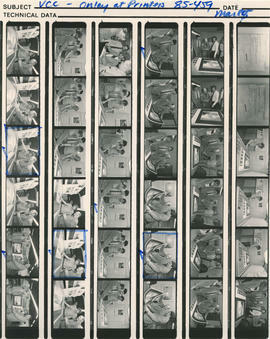 File consists of seven negative strips with twenty-seven images and ten prints that do not correspond to the negatives. File consists of twenty photographs of Party Party Tour activities. 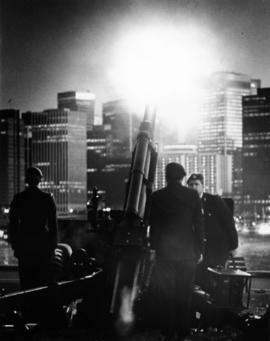 File consists of two contact sheets with a total of sixty-one images, one of which is included in the file as a print. Note on original envelope read: "Tillicum: dancing with dragon, walking parade route, greeting people." "Marking the occasion of the visit of Their Royal Highnesses to Vancouver, British Columbia the twentieth day of October, nineteen hundred and fifty one- Hotel Vancouver"
File consists of one contact sheet with a total of thirty-six images and three prints. File consists of one contact sheet with a total of twenty images. J.S. Matthews' motes with print or negative in Archives. 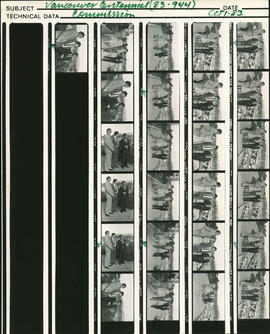 File consists of three contact sheets with a total of 93 images. Mayor Michael Harcourt and Tillicum are featured in several of the images. Dont miss it for the world! The 1986 World Exposition. Professionally taken group portrait. Photograph shows L-R: William H. Evans, Alex Mitchell, Adam? Scott, Rev. Dr. E.D. 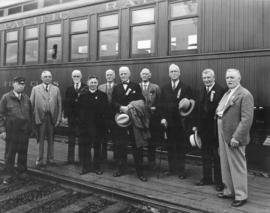 Bradeu?, John A. Forin, William Dilman?, John W. Coburn, George F. Gibson, John R. McKenzie, John H. Cocking.